Will Apple Maps keep you from buying iPhone 5? It's the question I should have asked nearly two weeks ago, instead of or perhaps in addition to "Will Apple Maps keep you from upgrading to iOS 6?" Surely the Cupertino, Calif.-based company must worry about such circumstance. On Friday, I asserted this concern as top reason CEO Tim Cook apologized for so-called "mapgate". Apple has a real problem. The new maps app, which replaces the one Google provided for five years, misidentifies locations, gives wrong directions and lacks details. Considering just how popular mapping and local search are to smartphone users, the bad publicity is sure to keep somebody from buying iPhone 5. That Cook's remedy is telling iOS 6 customers to use another mapping program spotlights just how bad is the situation and how great the concern bad publicity will hurt device sales. "If Apple was really truly sorry, it would restore the Google Maps app that it obliterated", It Advisor comments. That's crux of it. Cook's apology is more about protecting Apple -- brand image and iPhone 5 sales -- than doing anything for customers. 2twotees agree: "This workaround suggested by Apple doesn't do a damn thing for apps that use maps as part of their app. Shame on Apple for being so hard-headed. Get Google Maps back if you want to please your customers. Don't send us off on some goose chase workaround". Apple should be more concerned. Fifty-three precent of respondents to the iOS 6 poll answer "yes" that Apple Maps will keep them from upgrading. Twenty-one percent will upgrade, but a nearly-equal number don't have iOS devices. When removing the latter group so that the survey only includes responses from iOS device owners, the number waiting jumps to 68 percent. Of course, BetaNews readers tend to be more in-the-know and likely don't represent all iOS device owners. Still, it's helluva big number. To date, Apple has pretty good track record moving iOS device owners to the newest version. But the maps debacle risks rifting the platform, at least temporarily. PuzzledObserver comments: "That is shocking! An apology?!? It's the users' fault! There are plenty of places to go, why would they decide to go where the map is wrong? Apple accepts no apology no fault. In a few weeks, any iPhone 5 customer will be compensated by a plastic case. End of story". No one can argue the fact that Apple did a great job introducing new types of devices to the mainstream. Just like Microsoft was a key part of pushing the PC to the mainstream, or Google in bringing real improvements to the web. Apple has apologized for its new home-grown maps app, which gives errors and misdirections. 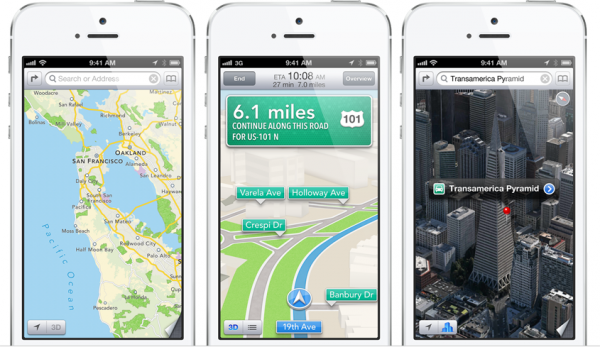 Will iOS 6 Maps keep you from buying iPhone 5? But now it's 2012. And this is the fact. I criticize Apple just as I would criticize any other company that simply isn't doing their job as they should. I can't accept people defending Apple and bashing other companies when Apple introduces to the market features that are in beta as if they are fully released products. At least Apple called Siri beta when introduced in iOS 5, although most people wouldn't know given the heavy TV advertising. I would call iOS 6 maps less than beta, after using the feature. Siri still is no better than beta, as I found out reviewing iPhone 5 last week. Google Now/voice search is remarkably good at getting to information asked for, while Siri has problems understanding speech and giving up anything. "Search the web" response gets old real fast. For many people, Apple Maps will be a step backwards. But many others may see iPhone 5's other features as leap enough forward. Is that you? Please respond to the headline question in comments below or take the poll above.